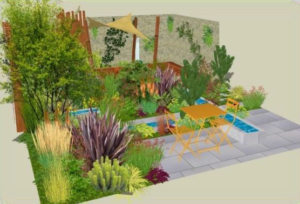 The Show Gardens at BBC Gardeners’ World Live are known for their inspirational design and planting whilst being relatable and packed with practical ideas that visitors can recreate in their own gardens. Visitors will enjoy the feature gardens, APL Avenue, Show Gardens, Showcase Gardens and Beautiful Borders in a relaxed and engaging atmosphere with picnics, bandstand entertainment and magic moments around every corner. 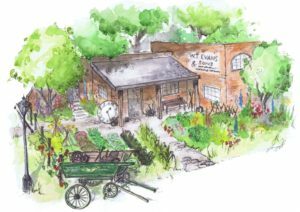 Inspired by the booming Jewellery Quarter of the late 1800s this garden steps back in time to a watchmaker’s workshop set in their back garden. The watchmaker is mid production of the iconic Chamberlain clock face. Heirloom and heritage vegetables and salads grow alongside cottage garden and self-seeded native flowers. Unkempt grass areas surround the space, with rustic paths and fencing along with Nasturtiums and climbing peas scrambling up posts. Trees and shrubs border the garden, giving a mature feel, as well as screening the boundaries. Experience the calmness, beauty and wellbeing benefits of being close to water as you visit this full-sized waterway complete with floating narrow boat, leggers hut and a tranquil and calming canal side garden. 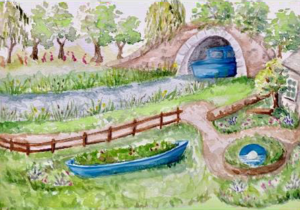 The garden surrounds the central canal with features typically found alongside waterways – including a vegetable garden – packed with healthy edible plants, a small private garden of calming and therapeutic flowers and a woodland of native trees and wildflowers growing alongside the towpath. 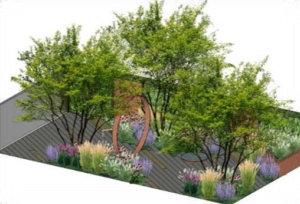 After achieving a Platinum Award and ‘Best Display of Summer Plants’ in 2018, Jon Wheatley and Stonebarn Landscapes return to BBC Gardeners’ World Live with an incredible walk-through Dahlia Garden. As visitors explore the technicolour of the garden and the plants within, they’ll be able to touch and smell the blooms as they go and uncover the latest new dahlia launched by Jon at the Show. 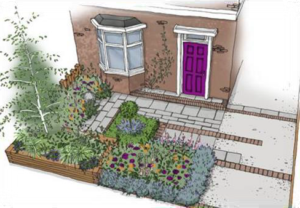 Martyn’s garden is inspired by the gifts left in wills to Macmillan Cancer Support. These vital legacy donations make up over a third of its funding and help support people living with cancer. The garden contains coloured planters of differing heights, referencing the ups and downs of cancer. Each planter represents a present – the tree inside a ‘gift’ for the future. 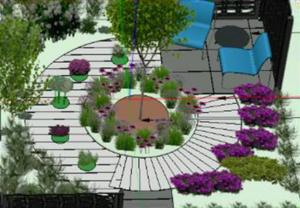 The design maximises the available space by including a roof garden and raised sun deck, a meandering path takes you through a Wild flower area which under plant the trees to attract wildlife, a symbolic sculpture represents hope, re birth and a new beginning. The inclusion of a Jacuzzi within the building demonstrates the first step to recovery. Marshalls are passionate about Creating Better Spaces®, from large-scale projects to making the most of a small patch. 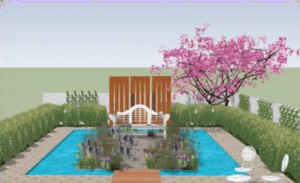 In 2019, the Marshalls Show Garden will encourage visitors to ‘fall in love with stone’ and all things made in Britain, with the aid and ideas from students at Solihull Academy near Birmingham. The Show Garden will showcase the unique aesthetics and character in every piece of stone from their exclusive Scoutmoor quarry, as well as concrete products manufactured at their various sites throughout the UK. 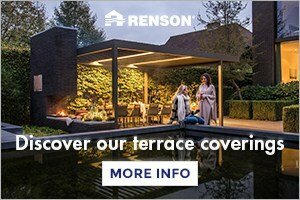 Overall, the garden will illustrate how a clever use of space teamed with great products can transform an area to make it both beautiful, useful and thoroughly enjoyable. In a design full of drama, four horses charge out in front of golden gates through a canal of water, surrounded by Catalpa trees and edged by scalloped laurel hedging. 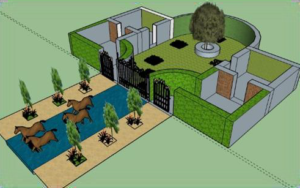 The large walled garden contains a series of ‘rooms’ including a Fibonacci style cobbled ammonite mosaic, teardrop Melancholic Garden featuring a wildflower meadow and large oak tree enclosed with a seat, a love garden and a joy garden. The Partners Garden is an inspirational and useable space that visitors will undoubtably relate to. 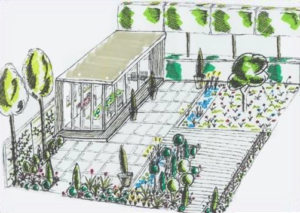 The beautifully designed garden will show visitors what can be achieved in a small area with a combination of formal and informal soft landscaping, a Garden Office and a structural hedging – all displaying Home Solutions by John Lewis’ unfaltering dedication to quality and customer service. 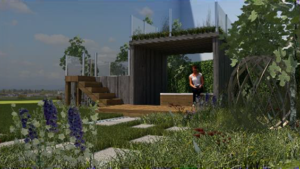 The Partnership Garden is presented by John Lewis Home Solutions and their accrediting partner for their landscaping sector, The APL (Association of Professional Landscapers) to promote their new partnership. 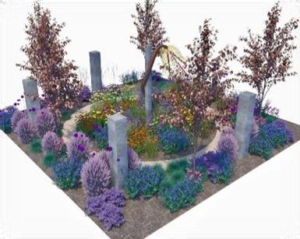 The garden represents the journey of stroke survivors. The path starts in a barren, rocky and unforgiving place, accentuated by the widely-spaced pavers and spiky fauna. The path gradually becomes softer, with an increasing abundance of life, before reaching its crescendo in an elevated, level, social area that looks back across their recovery journey. 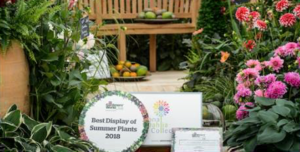 2019 marks the second year of the BBC Gardeners’ World Live Young Landscapers Competition supported by the APL (Association of Professional Landscapers). 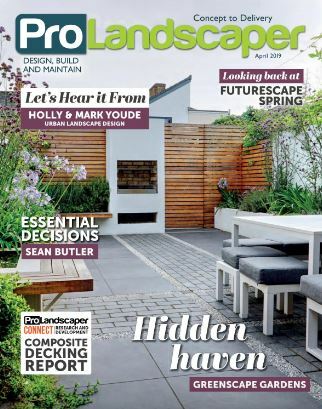 This important industry competition encourages newcomers to the profession as well as showing visitors ways to use Marshalls landscaping materials for very different results in an inspirational small garden layout. The 2019 contestants are the four young landscapers who took the top spots at the WorldSkills UK Finals in November – Matthew Wood, Sam Gordon, Reece MacKay and Brian Hughes. 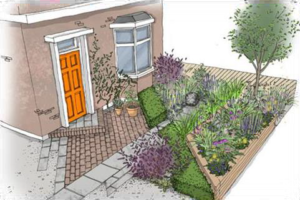 David Stevens said “This year the competition highlights front gardens which are so often overlooked, after all first impressions count! The two designs, one contemporary and the other more traditional, link strongly with the adjoining building. While planting naturally plays an important role so too does the hard landscape elements of paving, steps and boundaries. Laid out as though viewed from the house, this garden design includes inspiration from several countries. Marshalls’ Symphony Paving takes you from the house to the patio and seating area with a rill inspired by Yves Saint Laurent gardens and decking on stilts reminiscent of gardens of southern Florida. The planting is foliage-heavy with plenty of large-leafed shrubs and warm colours of the exotics. This garden takes heavy influence from a love of New York, in particular The High Line – a beautiful garden on a bridge over a disused railway line full of clean lines and contemporary styling. In a similar fashion, this garden design uses trees, perennials and ornamental grasses to create a sense of privacy, making it the perfect spot to relax with a Manhattan cocktail! This garden is designed for a young professional couple who have recently extended their period home with a small, linear garden, accessed from the house by simple sliding doors. The garden features metal, vertical decorative screens, raised stone clad planters. The planting scheme is inspired by trips to Australian rainforests, with a simple colour palette and green textural forms. Designed as an after-work escape, this garden is the place to relax and enjoy spending time together. There are strong Moroccan and Mediterranean influences and the planting includes a wild flower meadow, surrounded by a water feature and ornamental grasses and evergreen climbers along the fencing. An ornamental cherry tree features in the corner of the garden. This garden has been designed for keen travellers who have spent much of their working life visiting exotic countries and would like their own garden to be reminiscent of their South East Asian adventures. 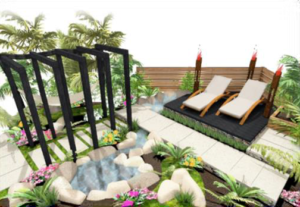 This garden is a fusion of ideas inspired by the natural landscapes of Indochina. The lounging areas are secluded by planting and offer a place to relax and appreciate the sound of the natural waterfall. The nursery rhyme is brought to life in a small garden combining traditional plants and planting with modern landscaping materials. This Showcase Garden takes inspiration from the origin of the rhyme, where female prisoners walked around the ‘mulberry bush’ with their children. 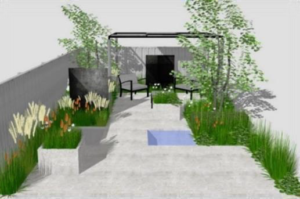 This Showcase Garden aims to raise awareness of the impact of childhood cancer on young people and their families. The garden design is inspired by one such child. A little girl who was always able to find a smile no matter what she was faced with. Her parents have been instrumental in the creation of this garden and the overall message is one of courage, strength, hope and above all else, love. Marshalls pride themselves as the leading hard landscaping provider for domestic gardens and driveways and are proud to have supplied products to all garden displays at BBC Gardeners’ World Live. 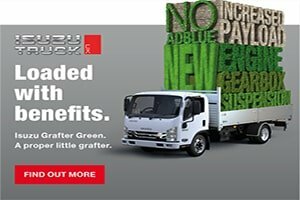 Organisers would also like to thank sponsors Rolawn, as the Show Garden designers and contractors are all able to benefit from their Medallion Turf and their safe, consistent, fertile growing media.